During 2010, as part of the continued expansion of the petroleum infrastructure in China, Brightoil Petroleum (Holdings) Limited announced that it would construct a new petroleum products storage facility in the Zhoushan area. The Zhoushan storage facility is being developed on the island of Waidiao Shan (Wai Island), approximately 150 km southeast of Shanghai, China. Construction began during 2011 and continues in early 2016. 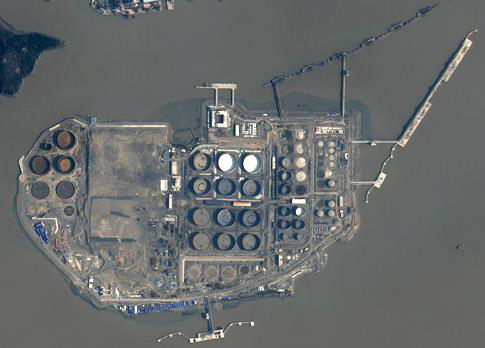 A comparison of KOMPSAT-2 and KOMPSAT-3 satellite imagery from January 2014 and January 2016 enables a detailed analysis of the construction phases and overall status of the storage facility. Please find detailed information from below attached original file.